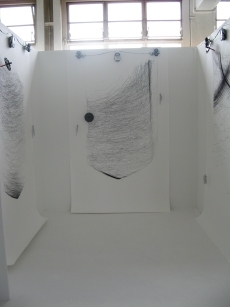 'Dialogue', uses autonomous drawing machines, created from children’s toys, to explore areas within specified boundaries. I have programmed one machine with a set of basic rules to determine it's behaviour - this machine initially makes a mark across the paper and then communicates it to the next machine using Bluetooth technology. This second machine attempts to copy this mark and sends it onto the third machine, which in turn interprets the mark and completes the chain by sending it back to the first machine. This continuous exchange should result in similar drawings, however, by adopting, in part, a ‘Heath Robinson’ approach in their assembly, I can challenge the notion of the infallibility of machines and add an element of play and humour to the work.